PREV NEXT	Home — Vince Gironda — Why Do Champion’s Muscles Look Different? 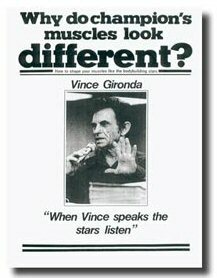 Vince Gironda’s Why Do Champion’s Muscles Look Different? course. Develop a body that appeals to more people and is more esthetically pleasing developed than some of our most famous bodybuilding champions.